What do you do when you’re tired of the prospect of dating? Two good friends (Jessica Walsh and Timothy Goodman) with opposite relationship problems found themselves single at the same time. As an experiment, they dated for 40 days. artcore journal asked Jessica Walsh to elaborate to give more insight into the introverted and extroverted aspects of dating for a project. Is being in a relationship all about the timing—being in the right place at the right time, there’s never a good time to start/stop dating, timing is everything, or everything has its limits? I think timing and being in the right place at the right time is a huge part of dating. For me, the first hurdle in dating is finding someone that fits many of the qualities I am looking for in a partner. Not everyone is like this, but if I am dating someone I want there to be the potential for something more serious to develop. Not that there is a rush, but I also don’t want to waste my time with someone I don’t think would work long term. The next hurdle is timing. Many times I’ve dated people who were a great match, but one or both of us weren’t ready for the relationship, or were too busy, and the relationship fell apart. I am sure there are also many relationships I might have had, which never happened, because I was in relationships with other people. One of the things we noticed in reading through the series of questions that were answered each day in 40 Days of Dating is that they began to read like a script from a he said/she said type of romantic comedy. We were always hoping for some type of John Cusak in Say Anything character reveal in the end. Do you feel that by having this type of mediated communication of your experiences and emotions that it changed the potential of your relationship? No, several months after the relationship ended I entered into a new relationship with an amazing guy and everything just works. We both fit the qualities of what we were looking for in a partner. We both were ready for a serious committed relationship. We both respect each other and help each other and trust each other. There is passion, but everything feels easy and feels right. With Tim, it was always a constant struggle. There were constant misunderstandings and arguments and communication breakdowns. We work as friends, but things fell apart when we tried to date romantically. I think under different circumstances, without the pressures of recording the relationship, it might have lasted a little longer. However, I don’t think we were right for each other and I don’t think it would have worked out, regardless of the experiment. How do you feel about having this documented history of your relationship and because it is exposed to the world in writing, video, and images does it become more real, or even more difficult to move forward from? It was really only a few weeks that we tried dating. In the context of most of my other relationships, this one would not have compared in intensity or seriousness. Yet recording the relationship and sharing it with the world made everything seem more special and more important. We shared a crazy experience with the site going viral, getting press and attention from Hollywood, and having fans weigh in on their thoughts about the relationship. It gave the relationship new meaning. Based on information from your website it appears several friends and co-workers supported the 40 Days of Dating Project. Like reality TV, moments get highlighted or cut in order to tell a coherent story. Watching the videos and reading the daily journals made us curious about the editing process. Did each of you ever see the other’s writing before it was posted? Did you ever talk about what you would write, and what information you would leave out and why? We only saw one another’s writings a few days before we posted them. There were many fights about what we wrote about each other. We often had different accounts of the same experience, which also led to arguments. It was mostly unedited, but there were just a few sensitive topics relating to family or friends who might have been offended that we left out details on. Without giving away the magic of interpretation can you explain some of the reasoning/methods behind the design of your website and the videos? Being designers, nice design and visual identities are part of how we express ourselves, so the aesthetic result came very natural to us. The videos were a perfect metaphor. The two of us staring at each other, trying to stay focused, while everything else (emotions, fears, habits, people, etc.) are trying to keep us from that focus. In a way, this project was an endurance test. For the past few years, Kayti Doolittle roamed the globe in search of stories. These stories have been published in Ink Magazine, The Culture Trip and The Atlantic Post. Today, Doolittle works as a freelance writer, storyteller, and researcher in Kansas City, Missouri. When she is not writing, she planning her next escape. 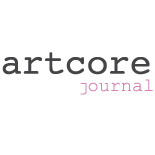 Erin Dziedzic is founder/editor of artcore journal. This entry was posted on January 14, 2015 by artcore journal in Issue 2: Introvert/Extrovert and tagged 40 Days of Dating.